Poseidon has lost his treasured trident, and your friends have disappeared while trying to find it. It turns out they have been captured by evil Hans the Kraken. Suckers! The Kraken plans to make a nice stew out of them. Can you prise open his tentacles, release your friends, and defeat him? Hope so. 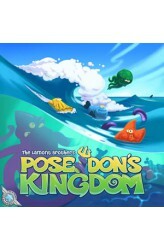 Oh, it's probably not a good time to mention the shark... Poseidon's Kingdom features a wave that crashes dice onto the board and the engaging game play of the highly-praised anthill system (from Antics!). On their turns, players first decide whether to improve their abilities by taking an "action tile" or place some of their personal dice onto the big 3D-wave, which is rolled over, when full, distributing up to 15 dice in a couple of seconds randomly all over the board. S.. 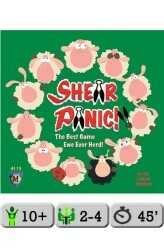 The second game from Fragor Games, featuring a flock of sheep and their attempts to be in the right place at the right time. Much gambolling, some tupping, lots of shearing. Publisher Blurb: "'The Best Game Ewe Ever Herd!' Ah, do ewe long for the life of a sheep? Bright summer days filled with games of tag and attempts to flock closer to Roger, the Heartthrob Ram? But, Watch Out! The shearer wants to drag you away from all the fun and games! In Shear Panic, ewe maneuver your ewes to score points, playing tag, standing close to Roger, or trying to avoid the shearing scissors! Will your brave sheep score the most points, or will it be "Off with the wool" for ewe?" The game includes eleven small figurines (which are somewhat fragile): Two each of four different colors, ..